This intersession register for “Race, Capitalism, and Bond”. The 2-credit course will run from January 7 to 25, meet on Mondays, Wednesdays, and Fridays from 1-4:45 p.m. and is instructed by Bryan Carter. Mass incarceration and policing in America costs billions in tax revenue despite fleeting evidence of their crime reduction capacity. Yet despite their cost and questionable effectiveness, they rank among the most durable American institutions. 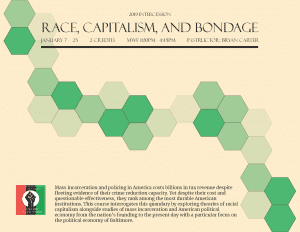 This course interrogates this quandary by exploring theories of racial capitalism alongside studies of mass incarceration and American political economy from the nation’s founding to the present day with a particular focus on the political economy of Baltimore.